Show your dog a treat, and then say “Go Find It” as you toss that treat on the floor away from the dog. At first, don’t toss it too far because you want the dog to learn what this game is all about. As soon as she eats the treat, call him back by saying “come” or “here” or my favorite word, “Com’ere.” Use your party-voice whenever you call your dog back to you — ALWAYS! Make sure to praise him up and applaud her when she comes back to you! Then quickly toss another treat somewhere else, keeping your dog fully engaged in this game of returning back to you. Once your dog understands what you’re doing, begin tossing the treats further and further away so you can call her back from further distances. You should play this in several different locations inside your house. This is a fun hunting game as well as a fun recall game. Dogs love it!! Start out standing just a few steps from the person you’ll be playing this game with. One person calls the dog to him with a happy word (e.g, “com’ere”), by luring him a treat. When the dog gets right in front of that person, he praises and gives that treat as a reward for coming. The second person then calls the dog and repeats this same process. When your dog gets really good at coming to each of you, (1) start increasing the distances between you and your partner a little bit at a time when you’re calling the dog back to you; (2) put that treat lure behind your back now, and bring it out only when your dog returns to each of you. Anytime you train your dog outside, make sure to use high-value food rewards (e.g., cooked bits of chicken, smelly cheese, tiny cooked meatballs, etc.). Put your dog on a 15-20 foot nylon long line (most pet supply stores carry these). Do not use a flexi-leash! Take a walk with your dog out in your backyard (if you don’t have a backyard work on this at a park or other safe area where you have some room to walk around holding that line). Give your dog plenty of line to allow him to wander away. Don’t pull on it at all. Randomly call your dog over to you, praise with your party-voice and reward him for coming treating her with those high-value treats. Switch directions as you walk around. Sometimes walk in large circles and then smaller ones. Walk at a slow pace at first, and use your happy recall word. Some dogs will recall right to the backdoor and then get a treat. But once some of those dogs have gotten the treat, off they go again 😉 This exercise will teach him that coming directly into the house is where the good stuff is. But you will need someone else to help you who can do a little bit of running. Also, everyone in your family needs to practice this so your dog knows to come to all of you when called. Put the dog on your 15-20 foot long line. Make sure you have plenty of your high-value food rewards in your pocket. Give your dog one of those treats right before you begin working with him. You should be standing close to your backdoor, but not at the door YET. Your assistant should begin by taking the dog to various places in your yard not too far from where you are standing. Call your dog to you using your designated recall word and your party-voice. If your dog doesn’t begin to come, have your assistant start running toward you holding the loop of that long-line and encouraging the dog to run with her. When your dog does reach you, give lots of praise and offer a treat. Then your assistant takes the dog to a different spot in the yard. Have your assistant take her to places where she likes to dig or to look for squirrels. Once your dog understands that you’re giving him scrumptious food rewards, she’ll begin to look in your direction and will start running on her own to get to you. Once your dog is running happily over to you, and your assistant no longer needs to hold onto the long-line, you can now place yourself right inside your backdoor holding the door open. Practice again calling your dog from various areas in the yard. Always offer a treat now right at the backdoor. The last part of this exercise consists of your recalling the dog right inside the backdoor. Start playing the GO FIND IT game, and toss one treat at a time all over the floor inside for at least 15 seconds. Quickly close the backdoor as soon as she’s in that room. Once she’s found all the treats, let him right back outside again to continue practicing recalling her back inside. Make sure to practice this game a lot. Your dog will eventually learn to trust you not to make all her fun end every time she is called into the house! This entry was posted in Behavior Information, Training Advice, Training Tips on October 24, 2018 by renee. I get stressed out each time I see an announcement for LOST DOG on Pawboost Alert. I would love to know how and why so many of these dogs are running away and getting lost. I thought it might be a good idea to discuss how to PREVENT this from happening. Keep in mind though if you have recently adopted a shelter or rescue dog, many will try to escape in the early days of coming home. So closely supervise your newly rescued dog for several weeks! Do not allow that dog to be out in your yard unsupervised! NEVER call a dog to you to do something unpleasant (e.g., to say “bad dog!” or to put him in his crate, or to take him to the vet’s or groomer). No matter when you call your dog, it should be with a happy, cheerful voice, even if you’re mad as hell. Dogs will not come to you if they think they’re going to be punished! Even if your dog comes home hours after you’ve been going crazy trying to find him, BE JOYFUL and praise him for coming home. Remember that punishment will teach him something bad will happen if he approaches you! NEVER chase your dog! Doing that will teach him/her running away from you is more fun than coming to you. Only use a food lure for 3 repetitions! Once you get past this first part of the game, you should hide your treats behind your back and offer it only when he’s right in front of you. Encourage everyone in your family to play these games. Start out with the dog standing between 2 family members who are at a small distance from one another. One person calls the dog saying, “Com’ere” and rewards with a treat as soon as he arrives. Then the second person calls the dog and repeats this same process. As the dog gets better at coming to each person, begin slightly increasing the distances that you’re calling the dog back to you. Start calling your dog from different rooms to find both people who are playing the game when he’s doing well. Toss a treat to the left of the dog and say “Go Find It.” Let him eat his treat. Then call him back to you saying “Com’ere.” When he is directly in front of you, give him a treat immediately. Then toss a treat way out to the right. Tell him “go find it!” Let him get his treat. Then call him back to you saying “Com’ere” and give him a treat immediately when he’s directly in front of you. Toss a treat out front of him and say “go find it.” Repeat this process over and over. Little by little, increase the distance you’re tossing those treats so he has to return back to you from further away to get his rewards! This entry was posted in Living with Your Dog, Training Advice, Training Tips, Uncategorized on October 9, 2018 by renee. Do you live with a toy dog? Toy dogs are classified as being 20 pounds or less. I have some helpful hints for you if you’re raising a little dog and you want to have a happy and healthy, well adjusted companion pet. First, keep in mind that a little dog views the world much differently. EVERYTHING looks huge to a little dog. This is why they seem so much more reactive to their environment. Some of these little dogs don’t know they’re little, based on their behaviors. Many of the small breeds seem like they’re very big dogs in small bodies. Movement also creates a lot of excitement to them – they’re always afraid that they’re going to get stepped on. Begin socializing your puppy as soon as you get him home. Each week introduce your new puppy to all sorts of different people, but not all at the same time. Introduce him to people coming into your home. Introduce him to your neighbors. Take him for walks in a park and teach him to sit politely for a greeting from a stranger. Hand the stranger a treat, and tell this person to wait for the dog to sit first, and then they can kneel down and offer the dog the treat reward. Try to find other friendly puppies or dogs of the same size or similar sizes to play with your dog. Put your dog in the car and take him with you on your errands. Take him to get gas in your car so that he gets used to someone reaching inside the car to give you change. Introduce your little dog to people in uniforms, like the mailman or a police officer. THE WINDOW OF SOCIALIZATION CLOSES AT 12-14 WEEKS. If you do not give your dog sufficient socialization, your dog will never reach his full potential of being a friendly dog. Little dogs seldom like it when people lean over them, or pet them over top of their heads. The best way for someone to greet your dog is to kneel down along their side, and pet them along that same side where they’re standing. If your dog shows any shyness or fearfulness, tell people NOT to make eye contact with your dog. Dogs consider staring as a threatening behavior. When you’re housetraining a small breed puppy, don’t lose your patience, because it may be more of a challenge to housetrain him than it would be with a German Shepherd, or a Golden Retriever. First, they have very little bladders, so don’t expect your toy dog puppy to hold it in for long periods. As soon as he’s finished a meal, take him out to relieve himself. If you’ve been training him with treats, take him out immediately following your training sessions because he’ll have to go for sure. Take extra special care in getting your puppy out very often to go to avoid accidents. So many people think that their little dogs don’t have feet! Put your dog down on all 4’s so that he can exercise. Sometimes, when you carry a little dog around all the time, you can give him a Napoleon Complex. Did you ever try to pet a Chihuahua or Pomeranian when their owners were carrying them around? You just might get bitten! Be very cautious about what dogs you introduce your little dog to. Big dogs sometimes see little dogs as DINNER! One thing you should consider before bringing a toy dog home. Toy dogs and little children don’t make the best combination. Children can accidentally injure little dogs, and some dogs have been killed because a small child has picked up the dog and dropped it. Many of the small dogs, as mentioned before, are more reactive to things, and they can be a little nippy and growly. Teach your children to respect your dog by not pulling tails, ears or jumping on the dog. Teach children that not all dogs like to be hugged or kissed on the face! Many times, children will get nipped or bitten on the face because of this very same thing. Teach children not to chase the dog, nor allow the dog to chase the children. All dogs have, what is referred to as, PREY DRIVE. Little children often behave like wounded prey! Running, screaming, arms flailing get dogs all excited, and will create inappropriate behavior in the dog because of that instinctual prey drive. Remember to supervise ALL interactions between the dog and your children. NO MATTER WHAT BREED OF DOG, ALWAYS SUPERVISE THE CHILDREN AND THE DOG WHEN THEY ARE TOGETHER. If you can’t supervise, please crate your dog or put him behind a baby gate until you can watch everybody. Once your dog matures to adulthood, you will have a perpetual 2 year old living with you! When walking your little dog, use a harness instead of a collar. I get very upset anytime I see a tiny dog being walked with a choke collar. Little dogs are prone to having a collapsed trachea, so putting any pressure on that area should always be avoided. Teach your toy dog obedience. Obedience is the way to let your dog know that you’re his decision-maker. When dogs don’t have confidence in their people, they will assume the role of decision and rule-making themselves. If your dog is growling at you, biting you or your children, OR, if he is demanding your attention and pretty much, ruling your house, your dog is telling you that he is taking on “your role” of being in charge. I see this waaay too often with dogs who are spoiled! Become a good pet-parent by requiring he earn his privileges. Do this by asking him to sit (or lie down, or make eye contact with you) before being fed his meals, his treats, playing with you, getting the leash put on for walks and rides, and for getting petted. Teach him that if he wants his meals and treats, and other desirable privileges that YOU decide he can have, he must do a little something for you FIRST. 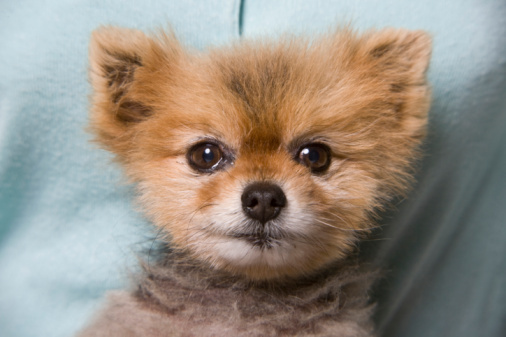 Little dogs are also prone to dental disease because their mouths can be crowded by their teeth. Learn to brush your dog’s teeth to avoid dental disease, which can also cause major health problems. Enjoy your toy dog and good luck! This entry was posted in Behavior Information, Living with Your Dog, Training Tips on May 30, 2015 by renee. Scratch marks or actual digging by the entrances of any doors leading out of the house. Scratch marks at windows or on window sills. Drooling in the front of the dog’s crate by the gate. Drooling by the doorways or windows. Destruction of blinds, draperies and woodwork indicates the dog may want to escape the house to look for you. Destruction of household furnishings (e.g., torn sofa cushions). Bowel excrement and urine anywhere in the house, including inside the crate. Sometimes dogs that are so severe might eliminate on walls and/or on furniture. Crates that have openings where the dog has tried to get out of it. Injuries that the dog might have inflicted upon himself, including wounds on his paws or other parts of his body done to reduce his own anxiety (akin to someone biting his nails). Neighbors that complain about the dog barking for hours anytime he’s left alone. Dog will not leave you alone for even a minute when you are home (aka Velcro Dog). Avoid making any fuss over your dog when greeting him after coming home from work or anytime you re-enter the home. If the dog is able to remain safely in his crate during the time he’s left alone, give him a filled Kong toy or other high-value chewy to keep him occupied during your absence. If your dog cannot stay safely in his crate without trying to escape it, or injure himself, try confining him to an area, such as the kitchen, using well-constructed baby gates or decorative metal gates high enough to prevent him from jumping out of it. Put a radio or TV on to provide background noise so your dog won’t feel quite so alone and isolated during your absence. If at all possible, ask a neighbor or a trustworthy teenager or professional pet sitter to stop by your house once or twice/day to give your dog a potty break and to take him for a walk or have a 1/2-hour play session with him. Consider taking your dog to a doggy daycare center for one or two days/week, if that’s a possibility. Even though it may be a bit costly for just one or two days, it might actually save you money in repairing damages done by the dog, and it will save you some grief and aggravation because the dog will become happier and more self-confident. Put your dog on a “Say Please” program This is a benevolent program where structure and non-physical discipline provides predictability in the dog’s life. Check out the article I’ve written on the website about this. AVOID PUNISHING THE DOG FOR ANY OF THESE BEHAVIORS! Your dog is already anxious. If you punish him, you will only increase the amount of anxiety he’s already experiencing, and his behaviors will only worsen. Please do not attribute his behavior to spitefulness or willfulness! Even though his behavior doesn’t make sense to you, dog behavior doesn’t have to make sense! Make your routine of leaving the house varied so the dog cannot ever really know the exact time that you’ll be exiting the house. Work hard on doing obedience training in a very positive manner (e.g., clicker training or any reward-based training method that avoids any and all corrections or punishments). Obedience training will motivate your dog to do behaviors that please you. This will strengthen your leadership role with him, and it will also help him become more confident that he can survive until you return to him. If your dog is showing severe SA behaviors, please discuss this at length with your veterinarian. There are pharmaceuticals he or she might recommend to help alleviate your dog’s feelings of stress and anxiety. .
An over-the-counter product that you can use without any prescription is called “Dog Appeasement Pheromones.” It looks like a Glade air freshener, and it also plugs into a wall outlet. Here is an article that talks about a scientific study that was done on the “DAP” product. You can get it on the net here at a reasonable price. Many separation-anxious dogs that I’ve worked with improved greatly when the DAP diffuser was plugged in. But of course, it depends on how severe the situation is. There are a few Yahoo group discussion lists on the web that deal with Separation Anxiety. You might benefit from subscribing to one or all of these lists to discuss your own issues and get advice from other owners who have experienced similar situations with their own dogs. 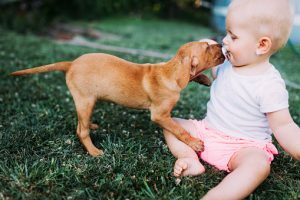 One of the biggest mistakes that young couples make is failing to get their dog used to having a new baby live in the house, when the dog has been an ”only child.” Sometimes the ”new arrival” is seen as an intruder into the pack, and this can have disastrous effects. Here are some very important steps you should follow when you are expecting a baby. Keep in mind that you should do these training steps well before the baby comes into your lives. Purchase as life-sized a baby-doll as you can find, preferably one that cries. If you can’t find a doll that comes with sound effects, you can purchase a CD that has baby sounds, which include crying. Wrap the doll in a clean diaper or blanket, preferably one that already has the scent of a baby on it. If you can’t get one that has a baby’s scent on it, sprinkle the diaper or blanket with some baby powder, and add a few drops of baby lotion too. Get into a routine where you’re carrying the ”baby” around the house with you. Talk to the baby much like you would if your real baby were in your arms. Pretend to feed the baby, and talk to the baby. Put the baby on your lap and watch TV. Try to make a daily routine with your new ”baby” and follow it so that your dog gets used to your new behavior. Allow your dog to sniff the new ”baby.” Praise him to the skies for calm and friendly behavior toward the doll. Put the doll into a stroller and start taking walks with baby and dog. Never forget to praise your dog for accepting the presence of the baby and for being well-behaved while you’re following your new routine as new mother. If your dog has been allowed on the sofa, you may want to re-think his having this privilege. Keep in mind that you may have your child in your lap, and your dog may now be wanting to jump up on the sofa when you now don’t want him up there while you’re holding your baby. Suppose you want to nurse your baby while sitting on the sofa? How will you react to the dog when he’s jumping up to sit with you? Plan ahead for situations like this, because if you need to change any of your dogs habits that you’ve accepted before, you need the time to do this now, not after the arrival of the baby. Another item you may want to have in your house during this desensitization period is the baby swing. Put the doll in the swing and turn the swing on. Watch your dog’s reaction to the swing. He may need to get used to this piece of equipment. He might start barking at it, or he may feel afraid of it. Play your CD with the babies crying everyday. Start out by playing the tape with a very low volume. Gradually accustom the dog to hearing the loud volume of crying babies and watch for any negative reactions. If the dog doesn’t tolerate high-pitched crying, turn the volume down to the level where he’s okay with it. Then begin to turn the volume up again until he’s completely okay with the sounds. Do not forget that you’ll still need to keep a normal routine with your dog. If you can keep a routine with the dog throughout this early period, the dog will be more inclined to accept everything else that’s going on in the house. Continue taking the dog for his regular exercise. Don’t slack up on this. If your dog isn’t able to expend his own excess energies, his behavior will deteriorate from boredom and loneliness. Teach your dog to keep all 4 on the floor. If you haven’t devoted too much time to obedience training, NOW is the time to really work on this. If you don’t know how to train the dog not to jump, please visit the Obedience Course at K9U.com and get help in this area. The last thing you want is your dog jumping when baby is in your arms. Remember that when you first bring your baby home, you may not feel like going out jogging with the dog everyday. You may want to start asking some dog-savvy kids in the neighborhood to begin walking the dog, or playing frisbee or fetch games with him. Get the dog used to new things like this early on instead of waiting until last minute. Keep in mind that you’re going to have times after the baby arrives when baby is screaming for his meal, and your dog has to go potty. Things can get pretty chaotic for awhile after the baby arrives. Just as you are planning ahead for the arrival of your new child, please plan ahead and think how you’re going to help your dog become comfortable with the baby. If, during these early days of getting the dog used to the doll, you see any signs that your dog is experiencing severe stress, or he’s showing any indications of wanting to bite the doll, PLEASE enlist the help of a professional trainer who can come to your home and create a program for you to follow with the dog. It’s better to find these things out now rather than have a disaster occur when the baby comes. If you think you need a trainer, you may want to visit http://www.apdt.com to get a list of trainers in your area. If you live in the south Jersey area, I’d be more than happy to get you started on your dog’s training program.